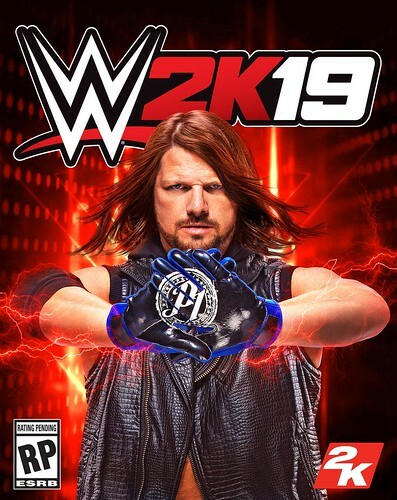 WWE 2K has announced that AJ Styles will be on the cover of the standard and deluxe editions of WWE 2K19, available October 9 on XB1, PS4, and PC. Those who purchase the deluxe and collector's editions can play the game four days early on October 5. The game will include the Million Dollar Challenge where the winner of a tournament will face Styles for a chance at one million dollars. At this time, no additional game information has been announced. Game update 1.07 (on PS4, 1.06 on XB1) is now available for WWE 2K18. This update focuses primarily on bug fixes and glitches such as fixing crashes, floating ladders, restoring lost host functionality, and more. WWE 2K18 Designer Cristo Kyriazis has shared the first details on the improvements coming to Universe Mode in a new blog. This year rivalries are now sorted into two categories: Potential Rivalries and Active Rivalries. Each type of rivalry will also feature Intensity, which will determine how the superstars interact, ranging from being sportsmanlike to very hostile. The calendar system has now been modified to match the real-life WWE TV & PPV schedules. Also new are Power Rankings and Goals. WWE 2K18 will feature two features called MyPLAYER and a new mode entitled Road to Glory (RTG). MyPLAYER - a staple in 2K titles - features more customization and options than ever before. This year, fans can use their MyPLAYER in both MyCAREER and Road to Glory. It is worth noting that as users begin to create their MyPLAYER, the initial options in the MyPLAYER Wizard will be limited but the user can go into greater detail through EDIT MyPLAYER and UPGRADES. Users can also unlock more parts and moves from new Loot Crates which can be acquired by spending in-game Virtual Currency. This form of VC can only be earned by playing the game and not through cash purchases, such as in the NBA 2K franchise. Per the blog: Road to Glory is completely new online experience where MyPLAYERS from all over the world battle against each other. Players can compete daily in a variety of match types to gain stars, boosts, Superstar parts and VC. In addition, by increasing their levels, they can further customize their MyPLAYERs to gain the advantage over others. Overall, players are encouraged to see if they have what it takes to secure entry into pay-per-view events and defeat their favorite WWE Superstars to earn special rewards. [I] WWE 2K18 MyCareer Designer Ramelle Ballesca has written a new blog detailing the improvements coming to the mode this year. 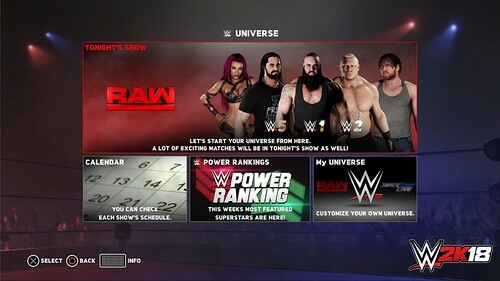 Among the improvements include storylines no longer shared from Universe Mode including two different paths, a free-roaming backstage, updated promos, and MyCAREER invasion allowing your friends created wrestlers to now show up backstage like any other WWE personality. The WWE 2K18 Collector's Edition will be centered around John Cena. Some of the extra content will include an exclusive Cena action figure, a ring mat and autographed Cena photo, and two (throwback) playable versions of Cena. In addition, two WWE legends return as part of the Collector's Edition: Batista (better known currently as Drax in Marvel's Guardians of the Galaxy movie franchise) and Rob Van Dam. 2K Sports has released the first information on the feature set for WWE 2K18. Some of the first feature set info includes an enhanced Creation Suite, new experiences for MyPLAYER and MyCAREER, a new mode entitled Road to Glory, a new graphics engine, a new commentary team, and the standard/expected gameplay additions and improvements. If the name of the new feature Road to Glory sounds familiar, it should. It was the name of the single player mode found in NCAA Football that saw users locked onto one player as they attempted to set statistical records and win championships. 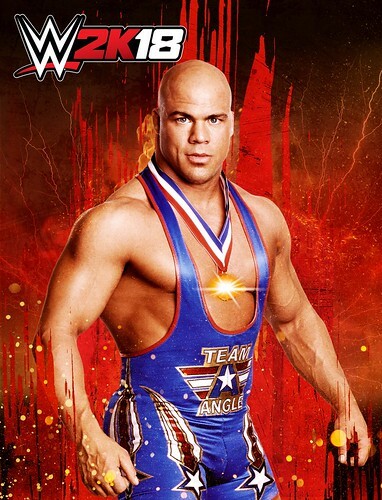 Announced via his Twitter account, Kurt Angle will be the pre-order bonus for WWE 2K18. Included will be two playable versions of Angle: the WWE "American Hero" version and the ECW "Wrestling Machine" persona. The Angle pre-order trailer will debut July 10 on Monday Night RAW. Additional details for the Deluxe & Collector's Editions are expected later this summer. Past pre-order bonus wrestlers for the WWE 2K franchise include Goldberg, Arnold Schwarzenegger/Terminator, Sting, and the Ultimate Warrior. 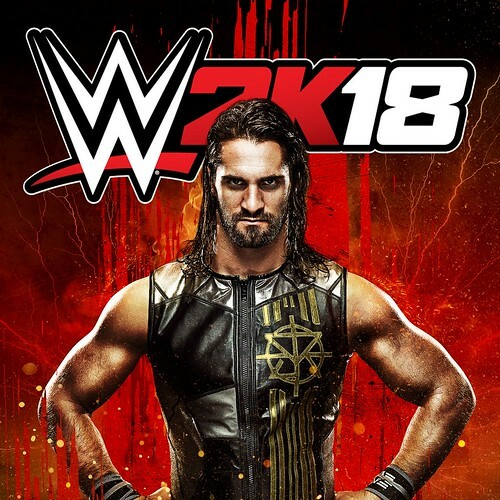 2K Sports has announced that Seth Rollins will be the WWE 2K18 cover star. The game will release on October 17, 2017 for Xbox One and PlayStation 4, with no last-gen version of the game being made this year. Those who pre-order the Deluxe or Collector's Editions of the game will be able to play the title four days early on October 13. Following the footsteps of Pharrell Williams and Jay-Z curating prior editions of NBA 2K, 2K Sports has announced that Puff Daddy himself, Sean Combs, will produce the WWE 2K17 soundtrack. The soundtrack consists of 13 songs including artists such as Black Sabbath, P. Diddy, Twenty One Pilots, and Travis Barker. Continuing the trend of offering a perk-laden special edition of WWE 2K, 2K Sports has announced a special NXT edition of WWE 2K17. A PS4 & XB1 exclusive, the NXT special edition will retail for $100 and include a signed Shinsuke Nakamura lithograph, a Finn Bálor figure, and collectible cards. In-game items include three playable characters (Shinsuke Nakamura, Nia Jax and Apollo Crews) and 50% more points at NXT in MyCareer as well as the pre-order Goldberg items. 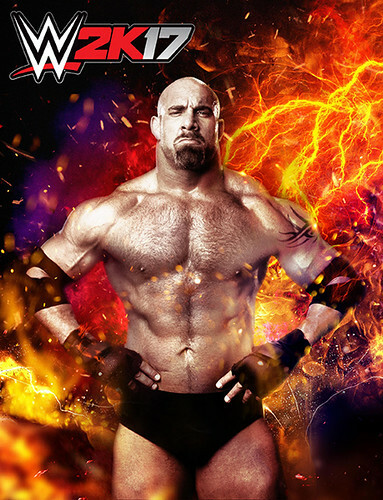 During tonight's episode of WWE Monday Night RAW, the first television spot for WWE 2K17 announced that pre-ordering the game will let users play as Goldberg. After more than a decade, one of the biggest and baddest Superstars to ever step foot in the squared circle is back! Pre-Order WWE 2K17 and receive two playable versions of the legendary Goldberg, as well as two classic WCW arenas! The two versions of Goldberg are black tights and black & white shorts. The two arenas are WCW Monday Nitro and Halloween Havoc. The WWE has announced a new multi-year extension with 2K as exclusive developer and publisher of WWE video game properties. 2K is the developer and publisher of both the WWE 2K franchise (consoles) and WWE Supercard (mobile). Financial terms of the new agreement were not disclosed. “We are thrilled with the positive momentum of the WWE 2K series, including generating year-over-year growth, as well as the success of WWE SuperCard," said David Ismailer, Chief Operating Officer for 2K. 2K acquired the rights to the WWE franchise from THQ on January 13, 2013 following THQ's move towards bankruptcy. There had been some speculation that a poor year for WWE 2K16 may have led to the end of the agreement. A new game update is now available for WWE 2K16. 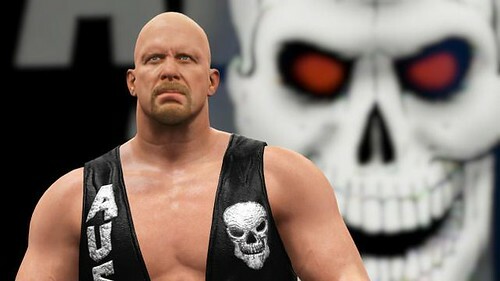 The update contains a significant number of improvements and fixes, but the WWE 2K team has singled out two items. 2K Tonight now uses 'Fair Fight' rules, meaning no created characters can be used and only default superstars and divas can be used. Submissions have also been tweaked. The update also adds support for the upcoming Legends DLC pack. Users who do not have the purchased content will still be able to compete against those who have it. The legends included in the pack are the Big Boss Man, Dusty Rhodes, Lita, Mr. Perfect, “Rowdy” Roddy Piper and Trish Stratus. 2K Sports has detailed the content and pricing information for the WWE 2K16 Downloadable Content, Season Pass, & Digital Deluxe Editions. The WWE 2K16 Season Pass costs $24.99 and includes the Accelerator (access to all unlockable content available in the game), Legends Pack, 2015 Hall of Fame Showcase. New Moves Pack, and the Future Stars Pack. The Legends Pack will include Big Boss Man, Dusty Rhodes, Lita, Mr. Perfect, “Rowdy” Roddy Piper, and Trish Stratus. The Future Stars Pack will include Samoa Joe, Diego, Fernando, Blake, and Murphy. Play WWE 2K16 Early – Only At Walmart! If live on the east coast or in the south and are looking to play WWE 2K16 early, look no further than your local Wal-Mart. Beginning today through the game's release date on October 27, the WWE 2K16 Early Access Tour will feature a playable demo of the game at select Wal-Mart locations. WWE 2K16 has completed their roster reveal for the title, coming late October. Including the pre-order bonus of The Terminator, the game will feature over 120 wrestlers including numerous Attitude-era wrestlers & 13 divas. With the reveal, WWE 2K released a statement announcing that Sasha Banks, Charlotte, Becky Lynch, and Bayley (known as The Four Horsewomen on WWE programming) will not be coming to the game, even as part of DLC. MyCareer - Similar to the feature found in NBA 2K, users must rise through the ranks as they strive to end their career in the WWE Hall of Fame. Along the way they can engage in personality-driven interviews, interfere with rivals, and more. WWE Universe - This year users can be assigned to multiple shows, allowing a broader experience. Gameplay - A new reversal system and pin system along with other improvements should provide a new perspective (if not spark) in the gameplay for WWE 2K16. 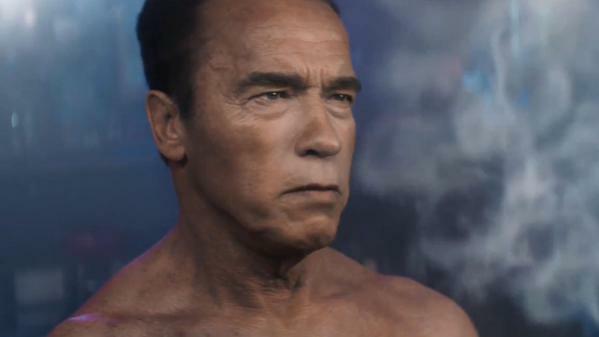 2K Sports has announced the pre-order bonus for WWE 2K16 - two versions of Arnold Schwarzenegger's iconic Terminator. Those who pre-order will be able to play as either the T-800 from the original 1984 film or as the T-800 from 1991's Terminator 2. This pre-order bonus is valid at retailers such as Gamestop, Amazon, et al.